What if I Forgot or Don’t Know My Password? 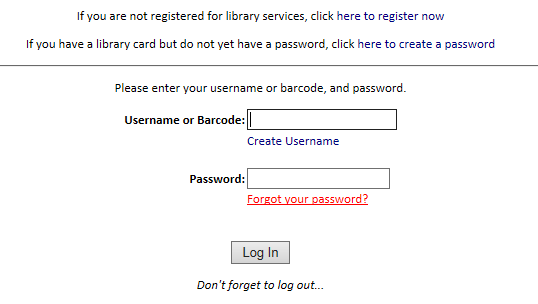 If you are still not able to login, please contact any outlet of the Erie County Library for help with your account. Patrons may change their password at any time by logging in and selecting “My Record” from the “My Account” menu then “Change Password.” Passwords must a 4 digit numeric code. How Can I Create a Username? 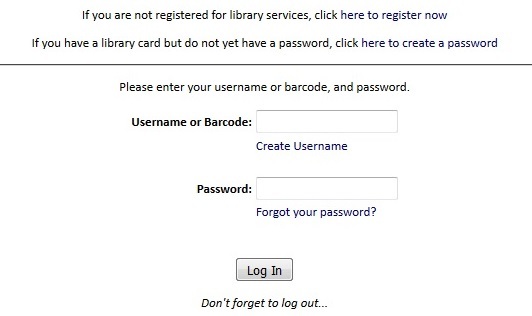 You have the option to create a username rather than using your library barcode to login to your account. At the login screen, select “Create Username.” You will need to know your barcode and password to create a username. Enter the desired information in the “Change Logon” area and then Save.